ASAP Zaytsevo received a respiratory ventilator. 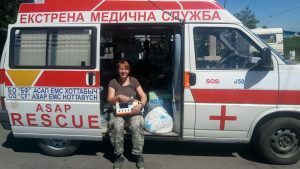 It will be used in an ambulance working on the front line in the Donetsk region. Funds for this important medical equipment were raised at a charitable Ukrainian dinner/fundraiser held on May 7 in the Centerville United Methodist Church. Thank you everyone who took part in the fundraiser! Special thank you to Yuliya Murashko​ , Tamara Rudolph​, Геннадий Мурашко​. This entry was posted in Humanitarian Aid, Medical Supplies and tagged fundraising, hospitals, wounded. Bookmark the permalink.